Puxada is a Portuguese word that means “pulled”. 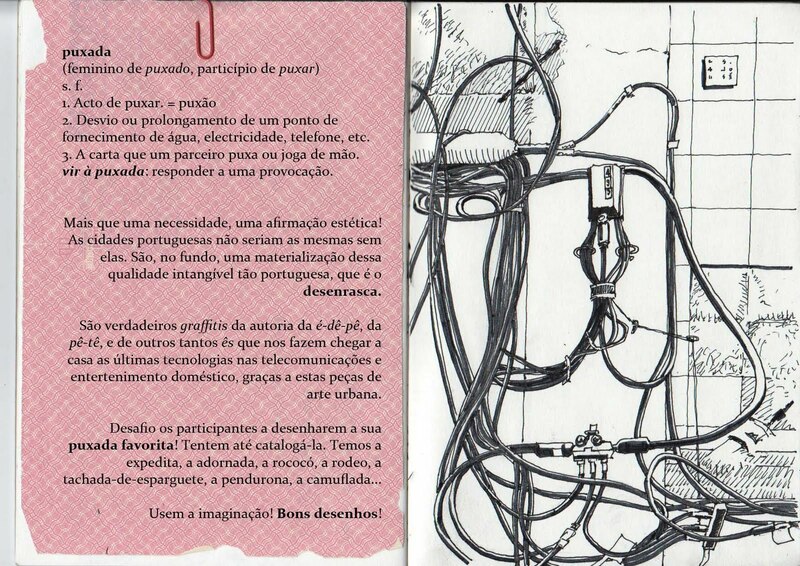 It also used to describe the incredible entanglements of power and communication cables fixed on the façades of most buildings in Portugal. Some puxadas are true works of art, testaments to the improvisation capability of our tech people. Whether you’re changing your internet provider, or you’re upgrading your switchboard, another layer is added to your puxada in a process that will allow future electronic archaeologists to know exactly what were your options in terms of commodities. A few years ago, I challenged the Urban Sketchers Portugal community to sketch puxadas, as they are a tough, intricate subject. The day before yesterday, I became a human puxada! I was scheduled for a sleep study, for which, the clinic staff took an hour an a half to attach, glue and connect all the 15 terminals that were to record my sleep patterns. I stopped considering going home by subway halfway during the installation. And I was right, given the people’s reaction during the short walk from the clinic to the taxi. It was a restless night. Hope it doesn’t tamper with the results. The next morning, I spent another hour and a half dissolving the glue on the terminals with acetone in a process that is still going on, as I keep finding tiny crusts of glue in my hair. It’s been a month now since Marina Grechanik’s workshop in Lisboa and it’s still kicking in. I’ve been experimenting a lot with ecolines, waterwashes as sketching base, big contrasts and form simplification. There’s actually not much story about these two spreads. Just a bunch of people I don’t know from the subway, the tram and the street. And a bunch of people I do know, in a bar. In a mixture of techniques very unlike me. Oh, and a couple dancing lindy hop. Or jitterbug. I keep forgetting which. A couple of friends were spending the weekend in a hotel in Azeitão, in the Setúbal peninsula, the large land platform between the Tejo and Sado estuaries. It is a complex territory, known for being heavily industrialized, but strangely enough, also for its vineyards and for being a haven for sun-seekers and nature-lovers. There are all kinds of small towns and villages, each with its own quirks and traditions. Further south, either by driving around or by crossing the Sado estuary, lies a strip of shiny thin sand more than sixty kilometers long, starting in the Tróia tourism resort and ending in the port town of Sines. Comporta beach was rich in iodine. The air was thick and fresh. Tróia was dry and silvery, the Arrábida range sheltering it, and the mouth of the Sado from the north wind. The night was falling on the way back to Azeitão. Our friends took us to the surprisingly affordable Quinta Vítor Guedes, which had a lovely patio and a large dining hall, and served “The best old fashioned duck rice of the world” or, the dish with the longest name in the menus of the world. It was indeed tasty, laden with chouriço and bacon besides the blend of roasted and juicy rice and the dark threads of duck meat. The fine local red wine matched in perfection with the meal. A tiny glass of moscatel in the town’s center heralded the time to head back to Lisboa. They were actually looking for the tombstone I had chosen as a foreground to my sketch. As a gentile, I feared a theological clash, so I wandered away as the horde of teens, lead by an older rabbi, bombarded the sights and several tombstones with flashes from digital cameras and smartphones. Once upon their objective, it was prayer and picture galore! Not since visiting Jim Morrison’s grave had I seen such a devotion and touristic enthusiasm for a tombstone. Later I found the grave belonged to a certain Rabbi Akiva Kornitzer, born in the Netherlands in the 19th century, who was Chief Rabbi of Krakow at some point. Kazimierz, which contained the Jewish Ghetto during the Nazi occupation, is peppered with quite ancient synagogues. Remuh Synagogue is perhaps one of the least interesting ones, but it’s one of two which are still active in Krakow. The thing I appreciated most was the devotion to the written word that Judaism exudes, in that even a tiny synagogue like Remuh has a proportional library of books available to its community. The 2-hour train ride to Oświęcim felt, for a few minutes, part of the experience of visiting the concentration camps. The train fills up as much as possible with people in Krakow’s Central Station and one wonders if all those people are going to visit the camps! It’s only after two stops, after almost everyone leaves at Krakow’s Business Park that the illusion is broken. After that a second illusion steps in: that of the increasingly desolate winter landscape of southern Poland. One can almost feel that the gloominess of the history has spread throughout these fields. The train is a 15-minute walk away from the camps, good for relaxing in preparation to the things to come. What one finds in visiting the camps is an immense conflict of words and feelings. Words like efficiency, death, system and chaos, could be used in the same sentences to describe the things that surround us. The order of things gets messy in one’s mind, while facing the industrialization of death. The mathematics of carnage. The science of killing. A smell of charcoal runs through the air during the hike back to the station. It’s the reason the camps were built in this region. It is rich in fossil fuel and labor is needed to extract and process it. The very same labor that inhabited and was murdered here.